I remember going back and forth in my head a million times, praying desperately for a sign from God to tell me whether or not I should attend the University of Florida. I remember flipping through a giant book of the best univerisities in the country - and found the long list of universtities with the top journalism programs. I remember pointing to the University of Florida after scanning through the list and saying "Mom, I want to go to the University of Florida!" And I made that statement really only knowing that one fact. 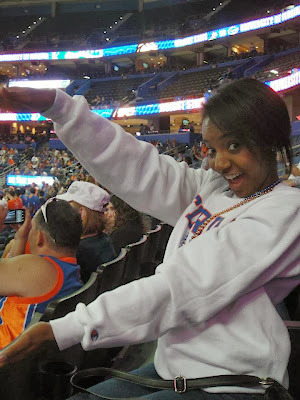 I had pretty much completely ignored the Florida Gators and their existence for 17 years of my life... until that day. I later found out it was one of the 12 universities in the Southeastern Conference (which is now 14 with the addition of Texas A&M and Mizzou), a conference that had always been super and appealing with so many Vols fans in my hometown. The more research I did, the more perfect it became for me and the more it met my qualifications, one by one: a large student population, a balance of excellent academics and strong social life amongst students, a huge athletic program and very far away from Tennessee. After I visiting the campus after dreaming about it for about seven months, I was left disappointed. It didn't exactly meet my expectations. After returning to Tennessee, I quickly applied to the University of Central Florida as my newest first option (I fell in love with their campus). It's actually funny how things work out - because UCF denied me due to my late application - and I settled with UF (or so I thought). You know how they say everything happens for a reason, and you always think "Yeah yeah yeah, can we get any more clique?" Well, I'll be the first to admit that that statement is true. I didn't need a sign from God, he already had a plan for me. And today, I am so happy and excited and proud and grateful to say that ending up at the University of Florida was one of the best things that's ever happened to me. I'm not saying that my first year wasn't the toughest year of my life, or that I haven't I made it here without sacrifice (especially my parents) - but that I know this is where I belong despite it all. Of all the organizations, events, shows, etc. 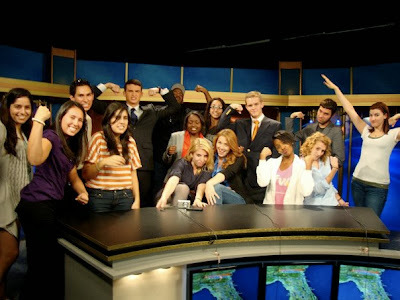 I've had a chance to partipate in at the University of Florida, the College of Journalism has provided me with the most invaluable experiences of them all. The amount of opportunities that I've offered throughout my four years here has been absolutely crazy. I've had the chance to work behind the schenes as a camera operator, floor director and assistant director on both morning and and evening newscasts put on by the student-run television station, WUFT. I've worked as a producer for a WUFT live radio show. I served as an intern for Country 103.7 The Gator, a country station broadcast right from the College of Journalism and Communications. I was able to serve as a reporter for WUFT's radio station, which is an NPR affiliate, as well as a reporter/videographer for WUFT-TV for the past two years. I was lucky enough to be the sideline reporter this semester for the live broadcast University of Florida's 90th Annual Homecoming Parade. 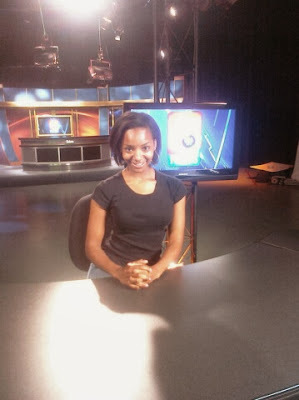 I am currently a main news anchor for the same newscast I worked behind the scenes for when I was just a freshman. I've come such a long way since then. I honestly have to say that the College of Journalism and Communications is the best college at this university. The number of resources we have is endless, from the Innovation News Center, where Journalism majors of all kinds gather news in one facility equipped with recording booths, desktops, computers and a live camera, to the Center for Media Innovation, or CMIR, which helps students push the limits of digital media. 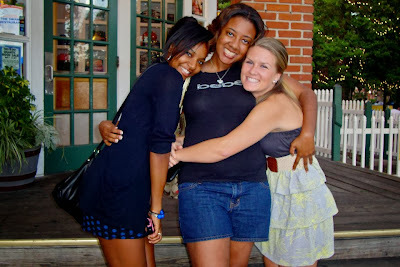 Although I've worked extremely hard as a student journalist, I've also had the time of my life outside the classroom. When people ask me what my favorite part about this school is, I always give the same answer: it is the perfect balance between work and play. To me, that's what college is all about. UF has given me the best four years of my life. And I'll carry that with me forever after my time is up on May 3rd, 2014 at 2014. Have you ever found yourself falling victim to a huge trend?... No matter how hard you tried to prevent yourself from conforming? I know I have. Well, the ones I actually like. You see, by the time trends reach me, or us, it really becomes a lot more of about a popularity thing and a lot less about how valuable it is, or how one person's isolated choice sparked something big. It's about who is doing it and why we should too. Or at least that's what I always thought. But Malcolm Gladwell's "The Tipping Point" opened my eyes a little. There's always more to the story, and I guess that's really every story. Gladwell's main argument in "The Tipping Point" is that almost every major trend or phenomenon has three major components, which he calls "three rules of epidemics": the Law of the Few, the Stickiness Factor, and the Power of Context. And with these three components, I've come up with one word or phrase to represent or describe the function or value of the component based on how I interpreted their impact. The first component is Law of the Few. To me, this component is all about influenece. I know you're first question is, "Okay, well who are the few?" The Few are the Connector, the Maven and the Salesman. The Connectors are the people that know people, and tons of them. People in various professional, social, economic and any other realms you can probably think of. The Mavens are push people to make the best decision and The Salesmans are the ones who, obviously, sell through persuasion. If you have a Connector, a Maven and a Salesman, your 1/3 of the way there. Now the Stickiness Factor is pretty self-explanatory. If you want a trend, it has to stick - it has to be memorable. If people can't remember it, it might as well disppear into a big, black hole forever. Most of the time, this means it is unique, rare and fresh. It is something people are captivated by and want to see more of, like the Kardashians. Okay, so they are a little dysfunctional, inappropiate and crazy... and you might not even like them, but the rest of the world does; yes, literally the world, not just the United States. The Kardashians are as sticky as can be. I explain the Power of Context in four words: right place, right time. I hate to make a music reference, but this is indeed a music blog. Big Sean says in his song "Don't Tell Me You Love Me", "What's the perfect girl if it's not the perfect time?" Well, this line definitely applies to trends as well. Just imagine if someone tried to start the fashion trend of crop top in the the conservative early 1900's. It just wouldn't work....and I bet Malcolm Gladwell can back me up on that. "The power which resides in her is new in nature. And none but she knows what that is which she can do, nor does she know until she has tried." Wise Words from Taylor Swift. Brilliant, right? And even more than brilliant... it's so true. We all care what people think to some extent, no matter how much anyone claims to not care. I promise you, if you hear enough stuff about you... it will affect you. I think it's healthy to care what people think. It really keeps you in check with your character flaws, but it also highlights the strengths you might not know you even had. It's important for people to see the negative and positive sides of themselves, and sometimes you can only see it through other people. We can be so blind when it comes to our own selves. The key to all this is knowing yourself; staying true to yourself and believing in your worth and uniqueness and individuality. If you believe in all these things, you won't feel the need to change no matter what people say. It's all about balance. Don't be ignorant to what people say but definitely don't let it tear you up and change you. That's probably the worst thing to ever lose... yourself. If I had to pick a biography for my older self, it would be this song. It's scary how accurate the detailed facts in this song are in comparison to my life. Right down to "your best friend's two months from her due date. You're gonna be a Godmother very soon babe" At the time when he mentioned the song to me, my best friend was pregnant with her first child. And guess who she asked to be the Godmother? Me. "Big Girl Big City" is that one little savior that reminds me to try and see myself through other's eyes... especially people who know me best, which my ex-boyfriend is most definitely one of them. I was in shock not totally because it was coming from him... but that somehow he (someone, anyone) believed all these wonderful and positive things about me, my work ethic, my potential and my life.... that I have so much to offer, that I'm worth so much more than I think, that I have the world in my hands and that I was going to make it to the top. I'm not saying I don't believe any of these things about myself, but I definitely have my share of doubts. Big time. But this song tells me that he doesn't. How is it that I have so many... but he is so confident in me? It's so hard to explain how much that means to me. I'm almost positive it was not a big deal for him, but it's something I will never forget. I'm a lucky girl for the people God has placed in my life... I really am. I'm switching it up for this post. Like, a lot. I'm not going to cover a song at all. I'm going to let you hear my very first investigative piece. You've probably never even heard of what my story is centered on, so don't feel bad. I didn't either, until I watched an episode of Law and Order: Special Victims Unit (which is one of my favorite shows on television). I'm surprised I hadn't seen the episode sooner considering I've seen every other episode at least twice. My television is always set on USA. And that's a solid, fact. B.D. Wong, who plays Dr. Huang in the show, mentioned a drug called ibogaine, which is currently illegal in the United States, and it's potential to treat and nearly cure addiction. It immediately sparked my interest. I'm not sure if it was the journalist in me or the fact that I was genuinely interested in this drug that seemed to be miraculous as to what it could do. I googled it as soon as the episode was over and found out ibogaine was in fact very real. And it was being used to treat addiction all across the world. And just like that, I had an idea for my first story. I was probably most proud of this story's research aspect because I had to do a lot of digging and really learn a large amount from the internet and my sources in order to properly understand this drug and its status in the U.S. and around the world. I hope this story opens your eyes just a little. There really are two sides two every story, each side with their own reasoning behind it. Always choose what you believe in and believe is right. You can't ever go wrong with that. Ever. Lets take a break from love and talk about life. I don't think I've done that since my Drake post. Below is my first post on a rendition. I like it significantly better than the original. You should check both out and see if you agree. No, you catch me when I'm fallin'. You catch me if I'm fallin'. You catch me if I'm falling down on you. I said " I'm under the gun..."
Man I said "I'm under the gun..."
I remember searching long and hard for this gem. I first heard it in the movie Something Borrowed. I guess that's how I discover a lot of amazing songs that I wouldn't have heard otherwise. They're always amongst some of my very best. What fascinates me most about "'Round Here" is that I still struggle understanding what it's about. It's defintely not one of those straight forward, on-the-surface songs that can be applied to a million and one circumstances. But even those songs have a detailed story behind them. The exact stories just didn't translate through the song, whether the writer did it on purpose or not. To someone standing on the outside, this song is a bunch of unrelated experiences and ideas squeezed into one song. But I know for the band that wrote it, (it was originally written by the band Counting Crows in case you missed that fact above), it means a little more than that... actually, a lot I'm sure. No matter what this song is about, I know it has a powerful backstory. And I don't dismiss its significance one bit just because I don't fully comprehend it. I assume that's why I listen to it so much. I think every time I listen I find a new way of interpreting it. I don't think I'll ever fully know what this song is about unless I sit down with a member of Counting Crows. And I think I'm okay with that. If there's one thing that I know for sure, it's that this song was written so carefully, not to mention beautifully. And despite my lack of complete comprehension, there are lines that I really, really love. "And in between the moon and you, the angels get a better view of the crumbling difference between wrong and right." Angels are flying in this picture. I just can't see them. This is the most beautiful spot I've ever been to in my entire life, and if there's anyone that deserves to inhabitat it... it's them. This line means so much. I think it does for anyone who lives on this Earth and recognizes that it can be so loving, accepting, and beautiful yet so hateful and cruel at the same time. I've always considered angels to be somewhat omniscient. Of course not in all aspects, but definitely in a visual sense. I'm sure things are a lot more clear from up there ("up there" as in heaven), and I think Counting Crows would agree. I think the closer you get to Earth, the more cloudy things get; specifically the judgments and choices we make as a human race. Shame on us for slowly losing sight of such a thing. Crumbling. That word haunts me in this context. Although we're losing sight of wrong and right piece by piece, in probably the smallest fragments you could ever imagine, we are heading towards deterioration. Now that's going to take some time... for loss of judgment between what's wrong and what's right... and I'm not going to be around for it nor would I ever want to. But someone will. Some 7 billion people. And me being gone doesn't make it sound any better. "Round here talk is just like lions. But we sacrifice like lambs." My first time seeing a lamb in the flesh. It brings me to this song. I think this line really represents us as people in general. Lions are firece, unbreakable, fearless and can't be touched. And I think that's how we often portray ourselves. We pretend we are a lot stronger than we really are and I think that's okay. But when you look at what you're willing to sacrifice, whatever it may be and for whatever reason, it really reflects what you're all about. Sacrifice is one of the hardest things to do. In reality, who really wants to give one thing up for another? We all want to take all that we can get without facing the consequence of losing something in return. "'Round Here" is that one little savior that reminds me to stop and take a look at the world and the people around me. It reminds me to think beyond the surface, because there is always something there. Always. I'm Courtney and words mean everything. Literally. I'm a sucker for pop culture, and writing/reading thoughts. If you live and breathe this blog, I'm doing my job.